We have some progress in the DIY kitchen renovation! Sure, this renovation has been going on for about 3 years, but better late than never, right? Isn’t she purdy?! I finally feel like the island now belongs in this kitchen and matches the style much better. 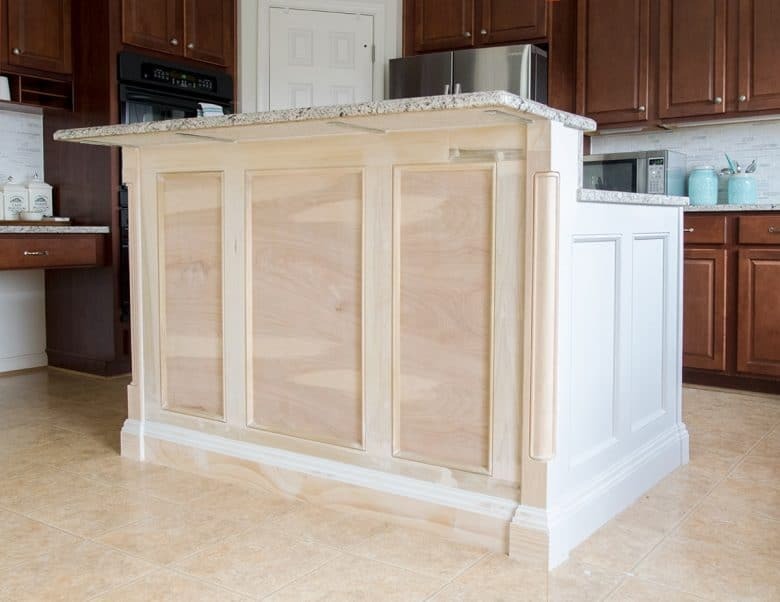 While our island may look like a project you need to hire out for, it is actually much simpler than it looks. It’s really all about the layering and breaking down the design. You only need some basic woodworking skills and tools to build something like this, I promise. 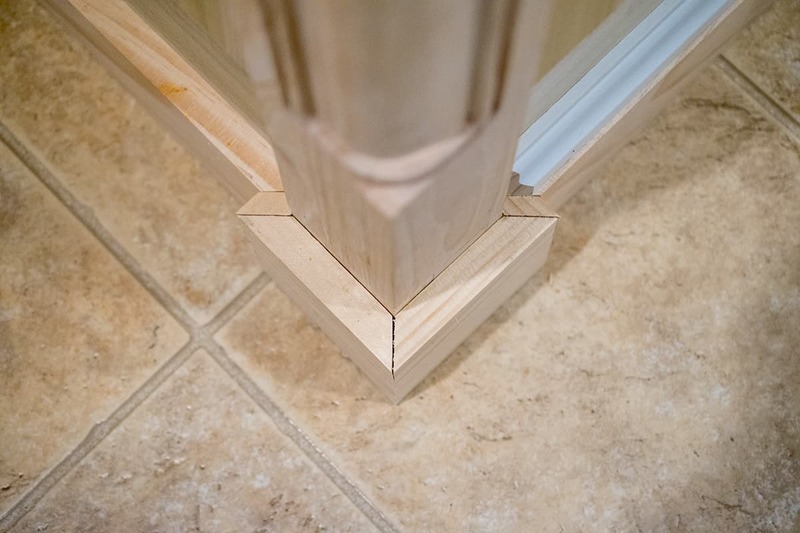 If you can cut a 45 degree angle, you can add trim to a kitchen island. 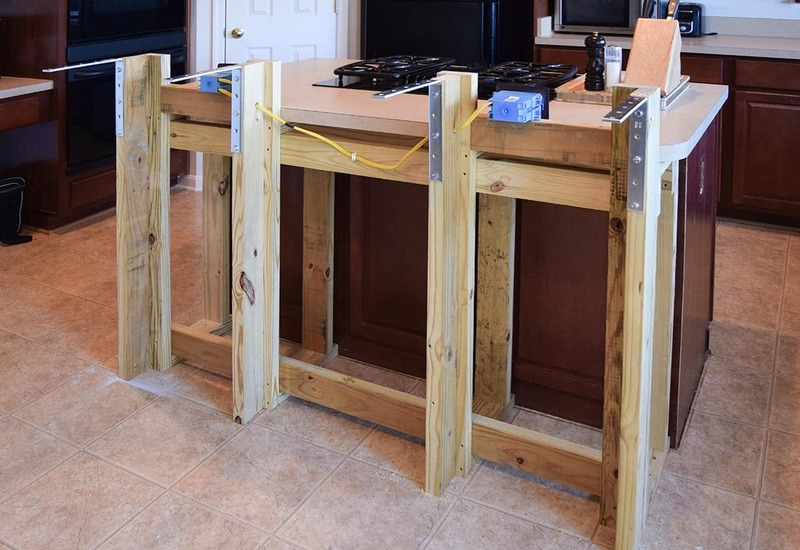 This is the framework we built 3 years ago, before the kitchen counter tops were installed. Although we originally faced the island with AirStone, we ripped it all back down to start fresh. To make everything properly level again, we added some plywood sheets. We had the nice guys at Home Depot cut them to size for us and then we cut the notches out with a circular saw. A fair warning though: Always, always double check their measurements! We added these beautiful corner posts to anchor everything together and give the island some dimension. You can use a Miter saw (my preference), table saw, or miter box. I would only recommend a miter box for 1/4 inch thick boards. We always double check the chop saw or table saw with a carpenter triangle to make sure it’s straight up and down. Always measure from the longest side of the cuts. If you plan on painting it, the corners are much more forgiving with wood filler. Check twice to make sure you are cutting the correct angle direction. We have caught ourselves many times about to cut the reverse angle. Now it’s just about the layering. We used 1/2 inch pre-cut poplar or premium pine (the kind without knots) trim boards from Lowes and Home Depot. We actually had to go to both stores to get enough. The rest is just trim boards out of the decorative trim section. We added small trim to the inside of the boxes and then baseboards to the bottom to create a nice layered effect. Although we were pretty good about any gaps and ridges, I filled in any joints with wood filler or caulk. Wood filler is used for any flat surfaces or surfaces where I need some structure to feel smooth. Paintable Caulk is used to cover long sides or corner cuts that may need some flexibility to keep from cracking. 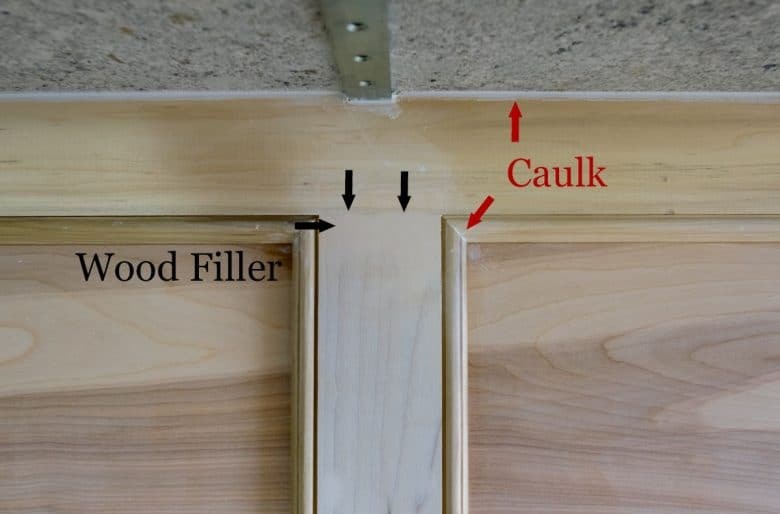 I use caulk anywhere the wood meets the counter tops, the tops of the baseboards, and the corners of the framing. 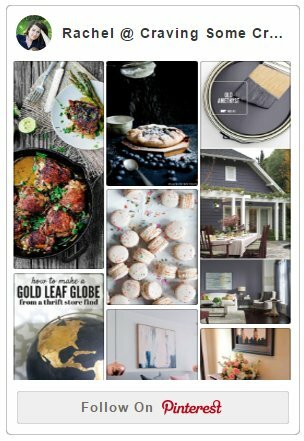 If you want to learn more about my techniques, I have posts about caulking baseboards and installing trim and wainscotting. The one key for me is using a quality wood filler like this. It goes on smoothly, can be thinned, and easy to work with and I have tried a lot of different wood fillers. The secret is to put in the work, meaning to fill each nail hole, every seam and joint. It really isn’t that bad though, I did all of it in a few hours. 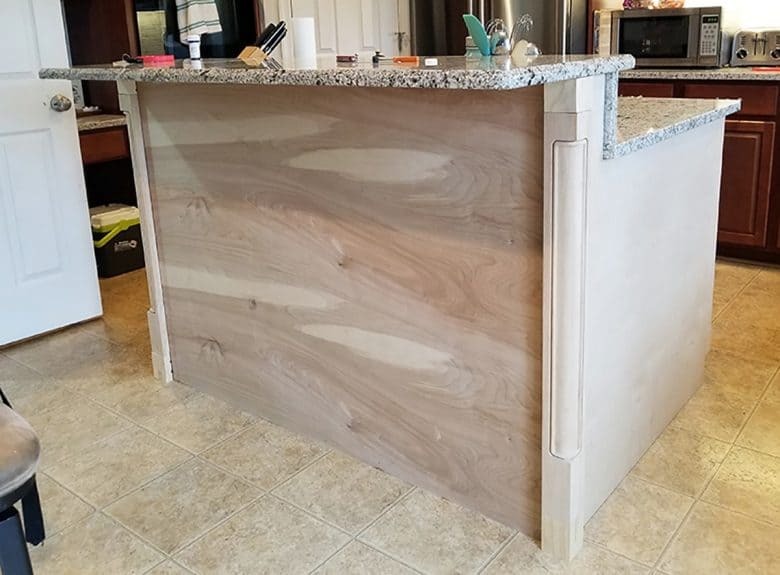 I usually do the wood filler first, then sanding the entire bar slightly and, lastly, caulk the seams. This is what makes the entire job look seamless and professional! You can see a bit of a sneek peek in this picture with the right side painted a light grey-white. You will just have to stick around though to see the complete reveal, since we are installing the new floors starting this week! *You can see how it turned out after being painted and the floors finished here. Great work! I look forward to seeing how it turns out.